The knockdowns at the hands of Errol Spence or the split-decision loss years ago to Nicola Stevanovic do not add up to the pain and anguish Chris van Heerden endured during the last couple days of 2018. Daniel Van Heerden, his father and best friend, was shot and killed in Meyerton, a suburb of Johannesburg, South Africa. 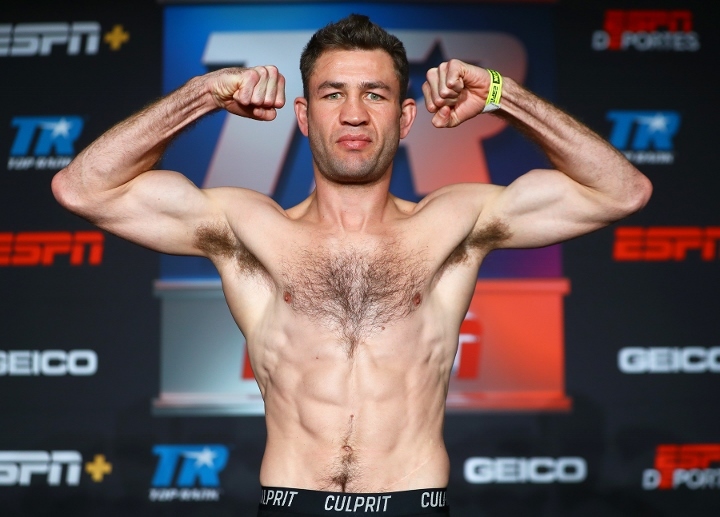 The news hit van Heerden hard, just five weeks after signing a promotional deal with Top Rank, fulfilling a dream since he was six years old. Rather than bask in that, van Heerden flew to South Africa to bury his father. He continues to greave, but van Heerden is moving forward with his career. The fringe welterweight contender returns to the ring tonight in a 10-round bout against Mexico’s Mahrony Montes at The Hangar in Costa Mesa, California. The fight will stream live on ESPN+ (6:30 p.m. ET/ 3:30 p.m. PT). The 31-year-old van Heerden will be fighting for the first time since winning by unanimous decision over Germany’s Timo Schwarzkopf on Apr. 27. The fight was the opening round of the Jose Sulaiman World Invitational welterweight tournament, which was cancelled this past fall by Real Deal Boxing, the promoter behind the tournament. Van Heerden has had to battle promotional issues that have kept him from fighting often, especially over the last three years. He has fought in Las Vegas, Hollywood, California, and in Toronto, where he suffered his second pro loss at the hands of Errol Spence in September of 2015. With the Top Rank deal in place, van Heerden is eager to fight often. Tonight will also mark another first for van Heerden. He has been working under the tutelage of former world titleholder Brian Viloria. The move comes after van Heerden first worked with trainer Freddie Roach after moving to the United States in late 2013. As much as van Heerden has found a comfort zone with Viloria, he longs for that comfort knowing he could speak to his father over the phone. The elder van Heerden, the father of 13 children, was shot in the back after a traffic dispute with a security officer, who is black. The suspect was arrested, but was released pending an upcoming trial. van Heerden misses the daily conversations with his father over the phone, but wants to use his platform with Top Rank and on social media for a greater cause. A victory could put van Heerden back in the world rankings by the sanctioning bodies. Van Heerden believes he can compete with any of the top welterweights in the division. Van Heerden claims not to be the fighter who fought Spence, stating he was dealing with personal issues leading up to the fight. Now managed by Peter Kahn, van Heerden is ready to write another chapter to his career.